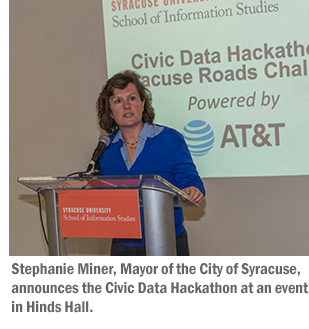 Stephanie Miner, mayor of the City of Syracuse, announces the Civic Data Hackathon at an event in Hinds Hall. 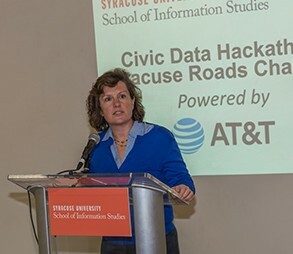 The partnership between the iSchool, the city and AT&T creates the first community-based hackathon in Syracuse that encourages community involvement in support of solutions to city infrastructure issues. Challenge participants will be provided with data about the current conditions of the city’s roads and will have the opportunity to create new applications and predictive analyses that could be used to help the administration address road quality issues. The challenge is designed to engage technologists, designers, developers and anyone else who is interested to use their skills for social good. It is one of the first times in the United States that a municipality has led a hackathon focused on road infrastructure. The challenge was created, in part, by alumnus Sam Edelstein, who earned a master’s degree in information management and a certificate of advanced study in data science at the iSchool. Edelstein now serves as the chief data officer for the City of Syracuse, and sits on the city’s newly formed innovation team. The challenge kicked off today when the city released the data. Participants have two weeks to work on their projects, and can participate in the Hack Upstate Fall Hackathon held on Oct. 8 and 9 using the city datasets, if they wish. The iSchool will provide open office hours with faculty members for any challenge participant to drop in and discuss the datasets, or receive advice on their project. Those office hours will be held on Sunday, Oct. 2.